Japan worked, Germany worked. We freed the French, we freed the Italians, we saved Europe, along with the Brits. Vietnam: It's just that the left fought so hard at home for the communists abroad that we couldn't win. People like Bill Ayers were setting bombs, and many others were such communist sympathizers that they didn't want us to win in Vietnam. The right of self-determination was never anything that could have happened in Vietnam. The people were living in huts in the Stone Age, and it was either us or the communists, neither one of which was indigenous. Our communist student movements allied with their government, in order to cancel the war, or cause so much trouble that it wasn't worth it. Which sealed that country's fate over the last forty years to one of economic stagnation. Now many of those same people would like to make our own country over into one much like Vietnam. Obama's mentor Frank was a communist who wanted us out of Vietnam. Ultimately, Obama will find some way to acknowledge his mentor, and cave in, I think. Nationalizing industry, nationalizing everything, until nothing works any longer, and Christianity is driven from the nation, in favor of the hammer and sickle. Wars cost plenty. At Gettysburg 5000 northerners died every hour at the peak of the battle. We haven't lost that many in all the years in Iraq, but the communists still think the cost is too high. If you compare South Korea -- with its thriving capitalist economy, its powerful universities, to North Korea, you have some inkling of the difference between capitalism and communism, and some sense of what the left consigned Vietnam to when they marched in the streets of this country so certain they were right. If only we could undo all that, and get Vietnam into the column of liberal democracies! It's not too late for Afghanistan and Iraq! The biggest problem in our foreign policy has been a lack of respect for history. All nations are not alike, and each situation must be understood on its own terms, not through the lens of an overriding ideological program. Fascist, and Communist, regimes are alike in seeing everything in terms of their own narrow definition of history and policy. But it's also a mistake to assume that all "Communist" states will behave in the same way, for the same reasons. Russia overran Eastern Europe and Central Asia not because they wanted to spread the "good word" of their espoused ideology. They wanted a "buffer" between Western states, and they wanted to exploit these countries for their own gain. Nothing particularly "communistic" about that. China, North Korea, Vietnam. Each presents a unique example. With respect to our behavior on the post-colonial world stage: Each region presents differently. There are occasions in which our military power might do some good; others in which it wouldn't. We can see in retrospect that Vietnam was a failure, not because we lacked the will, but because we had set up a puppet proxy regime more corrupt than the Communists in the North. The Viet Cong had the support of the people. We ended up fighting the whole country, instead of just an "insurgent." Today, Vietnam is a peaceful nation, with whom we have relaxed, amicable relations. It is not like North Korea, not like China, not like Argentina, not like Venezuela. 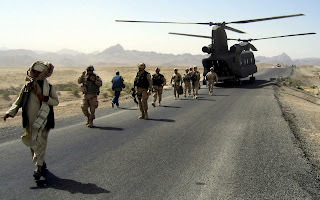 Iraq and Afghanistan will never be democracies--at least as we understand that word. Certainly not in our lifetimes. Finally, we need to admit that there are no "best" choices in these situations. Saddam Hussein was "better" than what we now are stuck with. Does that seem immoral? Very likely. But foreign policy is based on pragmatism, not Boy Scout logic. We make compromises with bad guys and reluctantly betray good guys. That's the way the world works. We would rather Putin wasn't running Russia, but we have to work with him. We wish the Taliban wasn't in control of Afghanistan, but sooner or later, we'll have to live with that outcome. The quicker we admit the reality of our situation in Iraq, Afghanistan and Pakistan, the sooner we'll be able to address our own needs (security, economic prosperity). We can't "fix" these countries--even if that were possible, the cost is simply too high. If only we could undo all that, and get Vietnam into the column of liberal democracies! It's not too late for Afghanistan and Iraq!" The world isn't a huge chessboard with countries in one column or another. Alliances and relationships are made through expediency, not for moral reasons. "Liberal democracy" won't flourish in some countries. Not because "we're" wrong, or "they're" wrong, but because circumstances and contexts are different. 30 years ago, the book on China was that it was a rigid, totalitarian, monolithic entity, leading its people into despair. But today, China leads the world in manufacturing, and soon it will pass the U.S. in consumption and GDP. What will China look like in 30 more years? I have no idea. But it seems certain that whatever we thought about China as a "typical" Communist state, won't be of much use in understanding and dealing with it in the future. The same could be said of Russia. There are certain aspects that are true for every country. Every country has pride; it is jealous of its reputation, its power, its standing in the world. If you step on a country, as if it were a troublesome bug, you can't expect it to respect you. The era of colonialism is over. Get used to it. There are two basic economic systems: socialist and capitalist. I don't think that there are any others. Every country has to choose which one is better, and since there are only two choices, you necessarily affiliate with the countries that have made the same choice that your own country has made. In the same way, Americans are not really able to just choose any leader. We have two great rugby scrums -- the Democrats and the Republicans. You choose one of these two, or else throw your vote to the wind. We have to choose from what is available, on a personal basis, just as countries do, on an international basis. Socialism works so long as it is voted in, but once it chooses a dictator for life, it no longer works. If it stops working, something else gets voted in. Even though we don't really choose a system when we vote, we do get to choose from two parties. Under Saddam Hussein, votes didn't matter. Under the Taliban, votes didn't matter. In Vietnam today, votes don't matter. In North Korea, votes don't matter. In Zimbabwe, perhaps the vote did matter, some years after the election the opposition finally got the prime minister position. In Japan under Hirohito, the vote didn't matter, and the people suffered. Now of course that we've rewritten their constitution, Japan has enjoyed an enormous surge in terms of quality of life. Under A. Hitler, Germany suffered, and became insufferable for all its neighbors. We crushed the Nazi regime, and put in a Democratic system (on our side of the border), and the people were once more able to thrive. Those that actively attack these properties (as Saddam did, or as the Taliban did, or as they did in Iran) are evil governments, that deserve to be knocked off. These are universal and self-evident rights. We may not be able to tell the thuggish regimes of Iran and N. Korea this, but if their people could speak, and could choose, they would gladly choose Locke over anything else. It's the best viewpoint-blind system. Thanks a lot for your comment on my blog today. It made my day. We used to argue so much, but at least we are now having more productive arguments! It is folly to compare the defeat of Nazi Germany, and Japan, with our military adventures in Korea, Vietnam, Iraq, Afghanistan, and our subtle incursions in Greece, Cuba, South American, Africa, and the former Yugoslavia. We've been largely unsuccessful in implementing a strategy designed to fend of socialistic tendencies around the world. We've used up untold resources trying to effect an outcome that was simply beyond our control. Kirby, your old domino theory and bi-furcated two choice political system theology is so tired. No one, not even the neo-Cons, believes it any more. The CEO speech in the movie Network very neatly summarizes it: The hegemony of the corporations. Money runs the world. Sometimes it's openly crooked, as in Russia, sometimes it's covertly corrupt, as in our country. Our government has been selling us out now for at least two generations. Our standard of living, and our economic, military and diplomatic standing in the world are all on the decline. It isn't because Allen Ginsberg wanted to seduce little boys, it's because a few greedy men manipulated the course of our governance to satisfy the desires of big capital. Communism, in its first manifestation, was primarily a DESCRIPTION of a problem. It didn't offer a sensible ALTERNATIVE to the evils of unbridled Capitalism. Capital must be contained within limits. Our present predicament is the result of not having sufficient oversight. We need to get back to that. It doesn't require moving mountains; we just need the courage to stand up and make these bankers and brokers and corporate boards play fair, and not screw the citizens. It isn't about redistribution of income. It isn't about the welfare state. It isn't about immorality. It's about whether a few people can be allowed to screw everyone else.